With a seemingly infinitely wide selection of climbing harnesses available, there is no sense in not having a harness that fits your body shape like a glove. 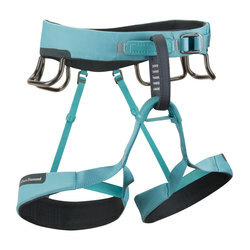 That said, this page is dedicated to climbing harnesses specifically designed to fit a women's body. So find the perfect new harness for yourself here on US Outdoor's online store, with unbeatable prices on high quality, durable, all weather, and adaptable harnesses. Available brands include Arcteryx, Black Diamond, Mammut, and Petzl Charlet. So find one that is perfect for you, stay comfortable on the wall, and climb on.